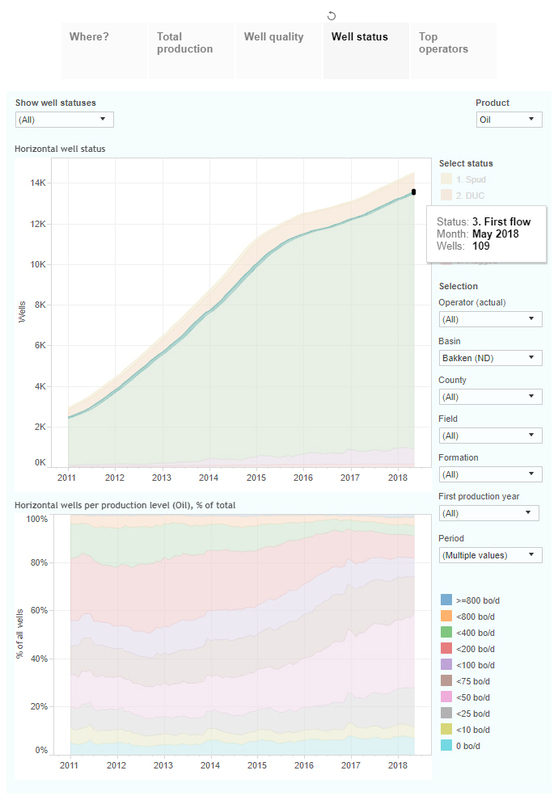 This interactive presentation contains the latest oil & gas production data through May from all 13,545 horizontal wells in North Dakota that started production since 2005. May oil production in North Dakota came in at 1,245 kbo/d, after a month-on-month increase of 1.6%. This pushed production higher than the previous all-time high in December 2014. 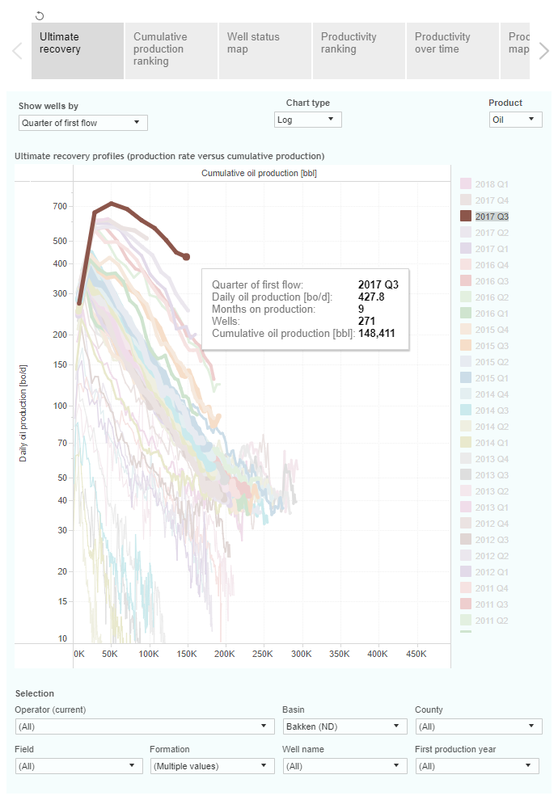 Recent wells are closely tracking the performance of the wells that started in 2017 (see the bottom graph in the ‘Well quality’ tab), on average. 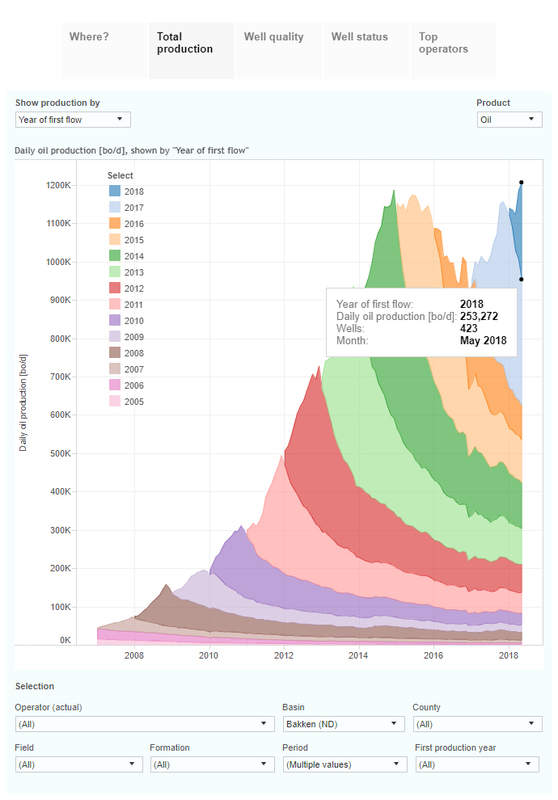 In May 109 new wells started flowing, the highest since September 2015 (see the ‘first flow’ status in the ‘Well status’ overview). 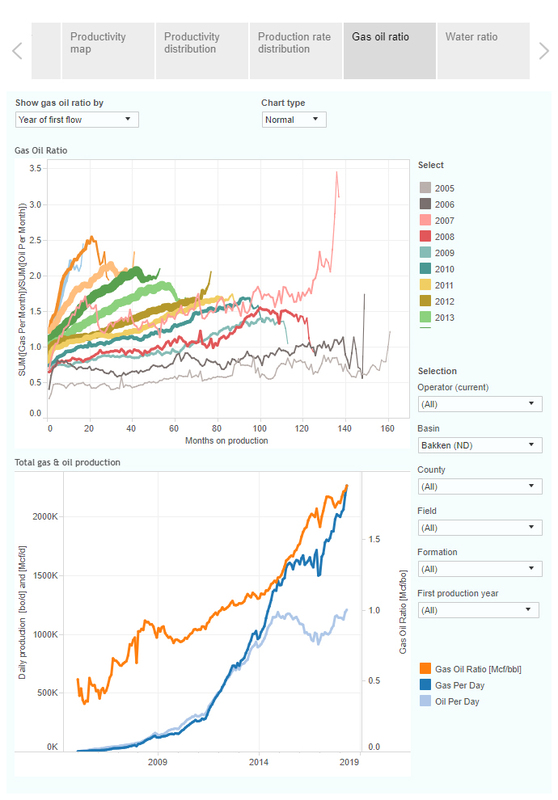 In the final tab (‘Top operators’) you’ll find that ConocoPhillips has grown production the most in the past 1.5 year (percentage wise), to almost 100 thousand barrels of oil per day, making it the 3rd largest producer in this state, behind Continental Resources and Whiting. 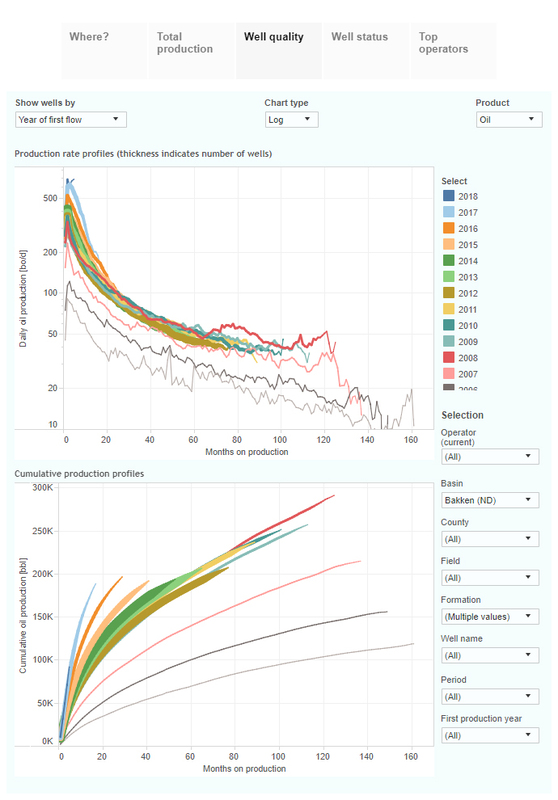 More wells started in 2017 than in 2016 (970 vs 724), and their initial performance was also substantially higher, as the plot above shows. They recovered on average almost 100 thousand barrels of oil in the first 6 months on production, a level that took almost 12 months for wells that started 2 years earlier. If you group the wells by the quarter in which they started (using the ‘Show wells by’ selection), you’ll see that the initial performance of the wells that started in the 3rd quarter last year was especially high, with close to 150 thousand barrels in the first 9 months. 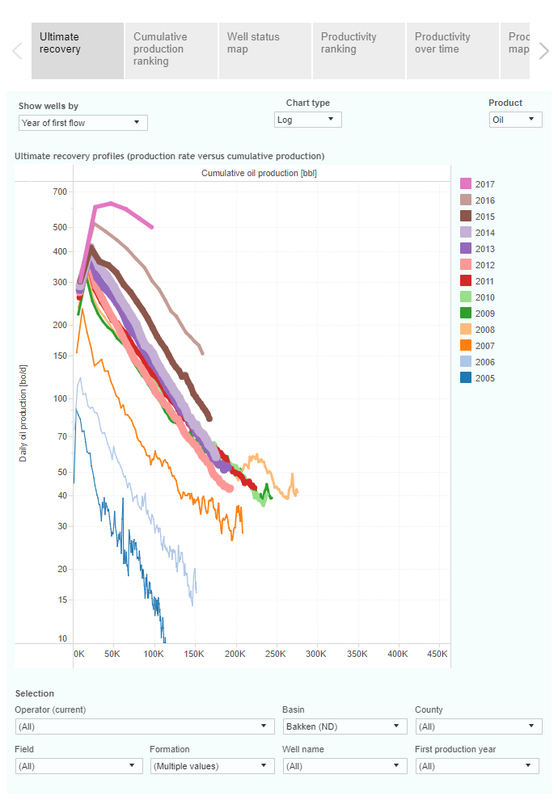 Although not so profitable, associated gas production rose even more, which becomes visible if you change the ‘Product’ selection to ‘Gas’. This is displayed in more depth in the 9th tab (‘Gas oil ratio’), where you can see in the bottom graph that this ratio has risen almost uninterruptedly in the past decade. As mentioned in my last posts, next week we will be present at the URTeC in Houston, so if you like to know more about our upcoming analytics services, I’ll be more than happy to show you our vision and give you a demo. We’ll start posting again in the week after.